You must be at least 7 years of age as of May 1, 2015, to audition for SUPER SINGER. Remember, if you are under 18 on the date of your audition, you must have a parent or legal guardian submit your audition video on your behalf. When can I submit my audition video? The time period to submit your online audition starts at 12:01 a.m. Eastern Time (ET) on May 1, 2015 and ends 11:59 p.m. ET on May 11, 2015. What if I am part of a group? We are only auditioning solo artists and duets. What am I supposed to include on my video? Please state your first and last name, the title of the song that you will be singing in your video and then sing your song! Please make sure that the total length of your audition video is no more than 2 minutes. Songs should be performed a cappella, with no backing tracks. Can I sing my own original song? Yes, but we’d prefer you sing a cover. 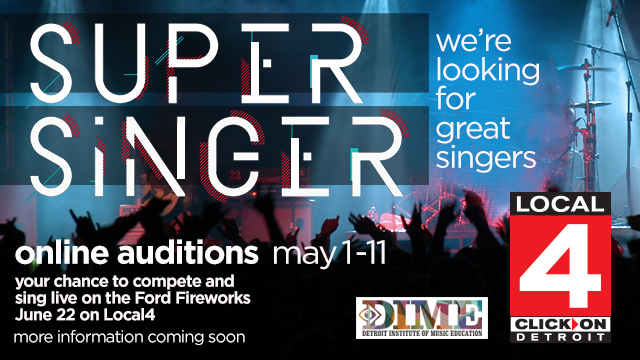 For the call backs and show performance, you’ll be required to sing a cover song. Can I sing only a part of a song? Can the song have background music? No, the performance must be a cappella. It can be any length up to 2 minutes (including a 30 second introduction that includes your name, the title of the song that you will be singing in your video and your age). Can I use a pre-existing video of myself singing? You may not submit a pre-existing video. How will I find out if I’m selected? If you are selected to move forward to the callback auditions, a producer from Local 4 will contact you via phone or email by 11:59 p.m. Wednesday, May 20, 2015. When submitting your audition video, you will be asked to provide contact information so that producers can reach you. Please double check that all of your contact details are accurate. Callback auditions will be scheduled for Thursday, May 21, 2015. If you are a minor, your parent or legal guardian must accompany you to any audition callback. Where will my callback take place? If you are selected to move forward, you will be contacted by a producer from Local 4 via phone or email. The producer will let you know the location of the callback as well as the time and date of your callback audition.